An off-balance corner to wandering, edgy face to slab. 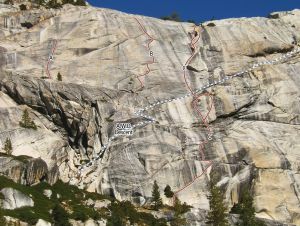 Set anchor at the base of the corner below the base of the second pitch of AWD. Tricky moves at the very top up slightly crumbly face to a mantle. FA: Alan Bartlett, Bruce Brossman, July 1984. Which SuperTopo guidebooks include a topo for Happy Hour? The impressive face of Mountaineer's Dome as seen from the base.